Today we are going to look at a multipurpose stereo system made by Sherwood. This is a speaker that can be used by practically any type of device from iPhones to Android smartphones, mp3 players and many other devices. Now let’s look at the device in more details. The design of this music dock is simple yet effective. It comes in a black color, so it will fit practically anywhere you place it. On top of the docking station there are four buttons – on/off button, bluetooth connect button, pause/play button and volume up and down button. These buttons are easy to reach and press thanks to their texture and position on top of the dock. 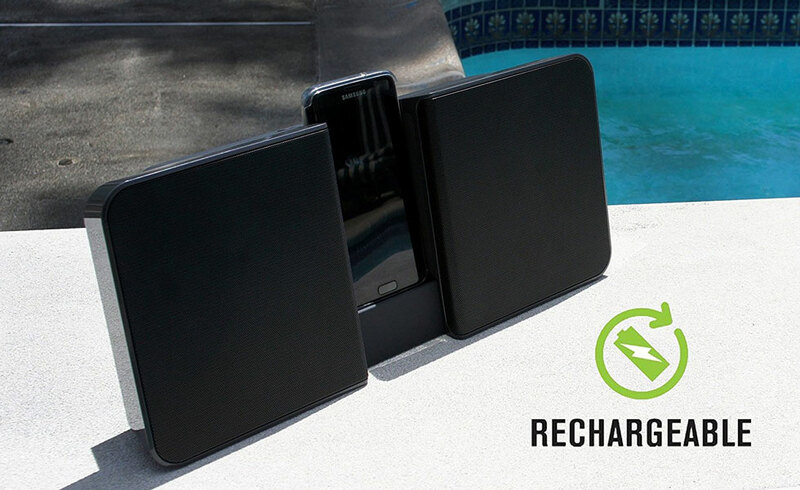 One of the best features of Sherwood bluetooth station is the ability to dock your smartphone between the speakers. 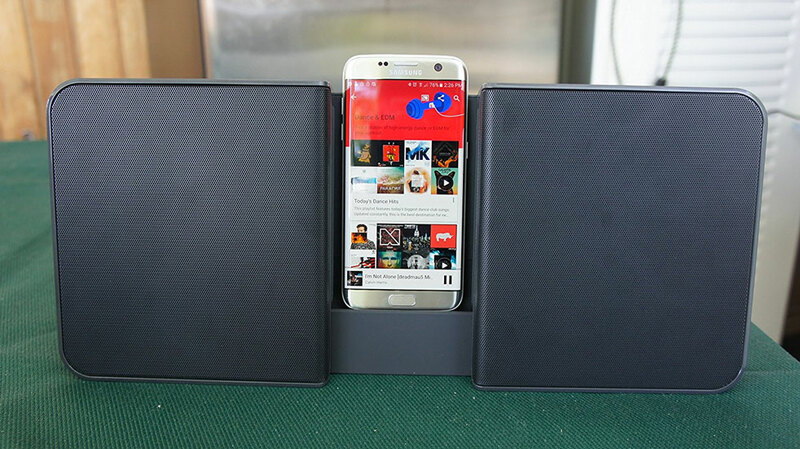 Both sides of speakers can be pulled aside to uncover a stand where you can place a smartphone or tablet in up to 8 inch width. This means that majority of today’s smartphones will easily fit into the dock. Another bonus is that the smartphone, tablet or music player can be charger while placed in the docking station by using a USB cable. Because this is stereo system in the first place, not a charging dock, we must pay the most attention to the sound quality and loudness of this device. First of all, I must say that this speaker dock outputs decent loudness and it will be much louder than your mobile phone’s speakers. The quality of sound is also pretty good for a music system that costs just below $40. Of course, it won’t be close as good as high end android docking stations such as ones made by Samsung costing well over $100, but for the money this is a good speaker dock that matches similarly priced bluetooth speakers. 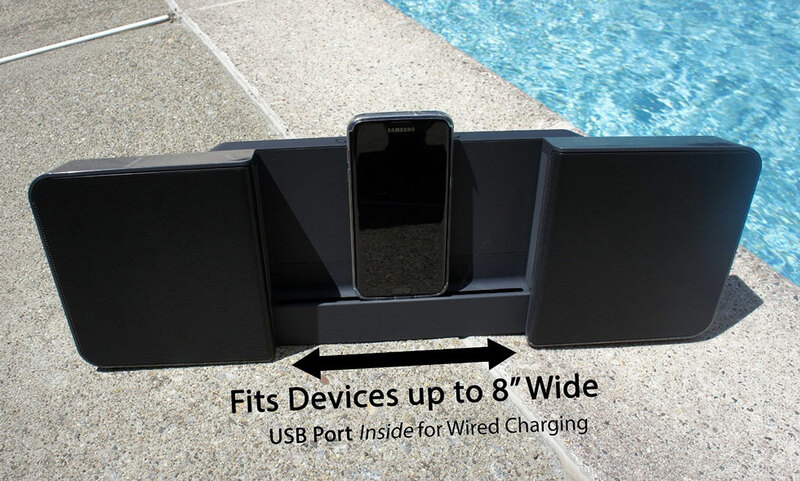 You can connect your smartphone, tablet, mp3 player or any other device to the speaker station using either a wired connection with a 3.5 aux cable or using a wireless bluetooth connection. Either way, you can expect a great sound quality without any losses even if using the bluetooth connection. As for the charging part, this android docking station has got an USB output so you can charge your mobile device while it plays music on the stereo system. Not only that, but you can charge practically any device that supports charging with an USB cable. All in all, this is a pretty solid docking station for your smartphone, tablet, mp3 player or any other music device. Its main advantages are good sound quality, possibility to dock up to 8 inch wide device and charge it at the same time using a USB charging cable, and the ability to play music while running on batteries for up to 6 hours. Of course, we cannot forget its price, currently selling just below $40, which is a very good price for such a feature rich device.